Pre-event material, maps etc <. .< Race 1 . < Race 2 . < Race 3. . To Interlude & Finale > - Other pictures. 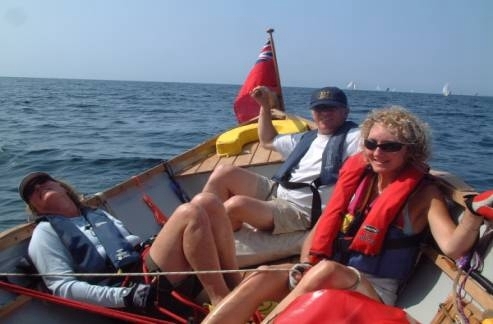 This day was Molly's namesakes's birthday: Mum didn't like tippy boats, but loved expeditions. She would have been happy enough with the day ahead: light SW winds, and easy, picturesque coastal sailing. 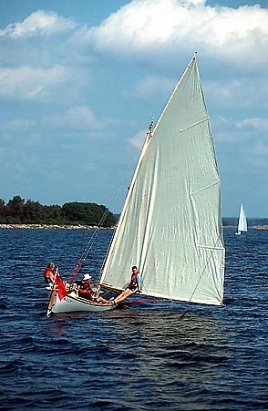 Race 4 is the morning leg to the lifting bridge between the islands of Almo and Hasslo: two of the six which guard the ancient naval base of Karlskrona, connected in many places with underwater barriers. Nelson approached this citadel after his victory over the Danes at Copenhagen in 1802; took one look, and sailed home. The sailing takes us out of the archipelago of scattered islands, four miles south into the light SW, looking for a pair of Cardinal marks designed to keep larger ships off the headland (the Danziger Gatt: nothing between us and Poland to S). None of the dramas of yesterday's sail to the lighthouse: just the familiar frustration of seeing the carbon-fibre blue boat sail away from us in light-airs tacking, accompanied today by all the Bermudan-rigged boats: Lena II, Sus, and First of May (gaff-rigged). Then, as we round the GATT, the wind fills in a little and veers to NW, so the leg to the first cardinal is dead downwind. We break free of Karla and Ben, but it backs again as we try to slip past Lena II, and we have to wait till we're rounding the mark and easing sheets again, till we take up the usual position of latter-day stern-chasers of the blue boat for second. Everyone gets a rest sometimes: Carson and Paul, first (above): and the afterguard don't seem to be working very hard either (left), whichever way you look at it - but Julia's balancing Emily! It's fun sailing again, and we learn a few things as well: downwind we gain half a knot from raising the centreboard (so it stays up); and there is no advantage, for us at least, in gybing downwind as Cybellule does: we seem to go just as fast over ground in a straight line, with the great mainsail skimming the wavelets to leeward, held down as often as not by Emily. 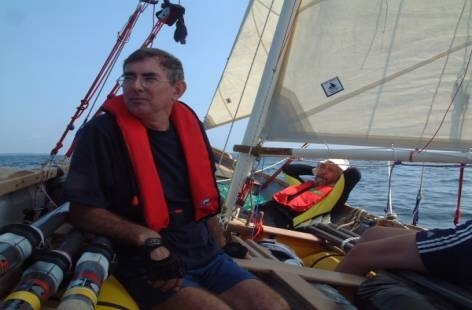 In any case, as in all the races where the first half has been spent close tacking in light airs, we can't eat up our deficit in the second, so we settle once again for a close second, and lunch at leisure on the decks of the friendly Djarv. Through the bridge under oars, well lunched, and we start race 5. This is much more to our taste; no early morning blues, a steady force 4 from behind as we sweep up NE to round a little group of islands (Ivo, Utto). A good fast reaching start and we're soon clear and away: the question is now, can we do well downwind and upwind in 18-20 knots of wind, with all full sail? The answer is a resounding 'yes' as we gybe smartly round the islands, storm into sight of Karlskrona itself, and harden onto a close fetch for the middle of the chain of Karlskrona's protective islands: Aspo! Paul navigates us confidently (always aware of the difficulty of being in front! ), The wind heads us as we come into Aspo's channel with Tjurko, we are tacking with full sail and a stiff breeze, and enjoying every moment. The opposition keeps its distance, and for only the second time since leaving Hallevik we come in first, and by a handsome margin. 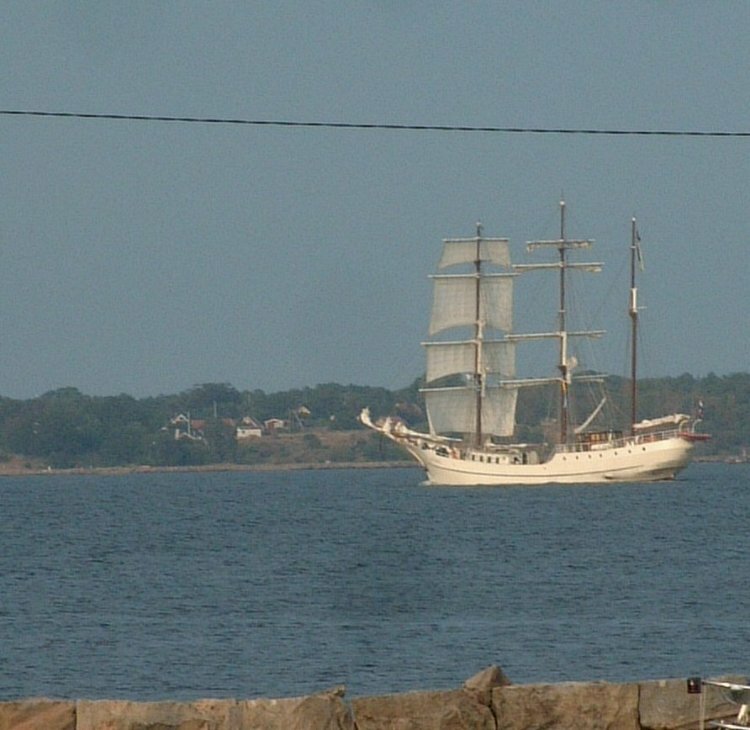 We change helmsman for a few minutes of fun sailing, and then head into Drottningskar, where dinner in the castle, a windy campsite, and a long day stormbound await us: but not before a handsome square-rigger has wafted into Karlskrona in the evening sun.